Comp-U-Train computer training > Tips & Tricks > Blog > Protect your computer with anti-malware software! Protect your computer with anti-malware software! Here at Comp-U-Train, we can’t stress the importance of installing anti-malware software on your PC. The term “Malware” is a portmanteau of “Malicious Software” and includes virus’; Trojans and keyloggers. 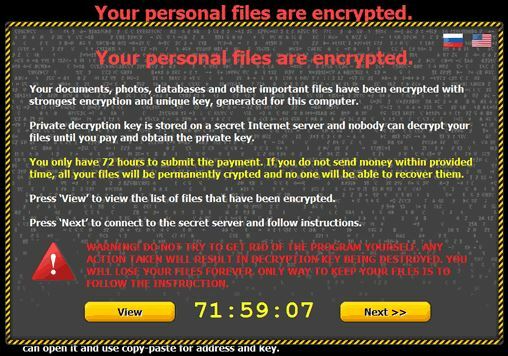 The latest type of malware to attack is called “Ransomware” and is so named because it holds the victim to ransom. 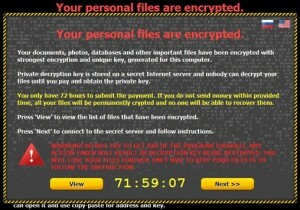 As an example, below is a screenshot of a very serious type of ransomware, which works by encrypting your hard drive, as well as any drives that you have plugged into the computer at the time of infection. To unencrypt your drives you need a special “unlocking” key. Unless you pay a certain amount of money to the malware company within a certain time, the key that has been used to encypt your computer will be destroyed and you will have lost the contents of your drives for ever! Comp-U-Train highly recommends the Bitdefender anti-malware programme to keep you safe and you can visit our webpage to order this excellent programme online.